This website is a project of WASH, the Washington Area Secular Humanists. WASH provides web host space for the site on a continuing basis. 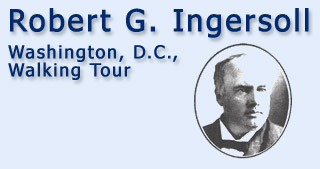 Information about Ingersoll’s activities in Washington, D.C., is taken chiefly from Robert G. Ingersoll: A Life by Frank Smith (Prometheus Books, Buffalo, N.Y., 1990). Helpful information was also provided by David Henley. Another excellent biography of Ingersoll is American Infidel: Robert G. Ingersoll: A Biography by Orvin Larson, ISBN 1-877733-33-4 (Citadel Press, New York, N.Y. 1962). Author: Gary C. Grassl, April 1995. Updated by Steven C. Lowe, June 2009. Web development, photo editing: Pete Lins. Printable PDF files: Steven C. Lowe. Graphic elements of the map are used with the kind permission of Yahoo!, correspondence ID KMM144195071V39173L0KM, dated March 2, 2009. Blanchard, George C. (April 2, 1910). “A Reporter's Notes. Recollections of Ingersoll and Golden Days,” The Truth Seeker. Cramer, C. H. (1952). Royal Bob: The Life of Robert G. Ingersoll. New York: Bobbs-Merrill. Dictionary of American Biography, Vol. V. (1961) . New York: Charles Scribner’s Sons. Donaldson, Frances F. (1968). The President’s Square: the Cosmos Club’s and other historic homes on Lafayette Square. New York: Vantage Press. Goode, James M. (1979). Capital Losses: A Cultural History of Washington’s Destroyed Buildings. Washington, D.C.: Smithsonian Institution. Kittredge, Herman E. (1911). Ingersoll: A Biographical Appreciation. New York: The Dresden Publishing Co.
Larson, Orvin. (1962). American Infidel: Robert G. Ingersoll, a Biography. New York: The Citadel Press. Robert Green Ingersoll Memorial Committee. (no date). Robert Green Ingersoll Birthplace Museum, Dresden, N.Y. [Brochure]. Box 664, Amherst, N.Y. 14226-0664. Smith, Frank. (1990). Robert G. Ingersoll: A Life. Buffalo, N.Y.: Prometheus Books. 1. Courtesy Emmett F. Fields of www.Bank-of-Wisdom.com. 5. D.C. Public Library, Washingtoniana Historical Image Collection, item #11008. 7. Library of Congress, Photo Collection. 9. Goode, 1979, p. 357; Library of Congress LC-G6-G4391. 11. The Washington Post, February 9, 1878, p. 4. ProQuest Historical Newspapers accessed through the D.C. Public Library. 12. Courtesy Historical Society of Washington, D.C., ST 459. 14. Courtesy Historical Society of Washington, D.C., CHS 07946; Library of Congress LC-G6-G4216. 15. Library of Congress, LC-USZ62-61338, 3b09016. 17. Courtesy Historical Society of Washington, D.C., CHS 01253. 18. The Washington Post, March 4, 1880, p. 4. ProQuest Historical Newspapers accessed through the D.C. Public Library. 19. Library of Congress, 3a46341u. 20. Library of Congress, Papers. 21. Courtesy Historical Society of Washington, D.C.
23. Donaldson, 1968, p. 55. 25. Donaldson, 1968, p. 55. 26. Library of Congress, LC-USZ62-86626, 3b33112. 27. Donaldson, 1968, p. 63. 29. The Republic: A Weekly Journal of Politics and Society, Vol. 4, No. 19, June 27, 1880, pp. 294-5. Washington, D.C. Part of the Washingtoniana Collection at the D.C. Public Library. 31. Goode, 1979, p. 155; Library of Congress LC-G6-G199, 3c28824. 34. Courtesy Washington College of Law Archives/Special Collections, April 2010. 36. Library of Congress, Papers.